I am pregnant; can I go on a dolphin excursion? Swimming ability is helpful; however I take people of all swimming levels. It’s OK if you’ve never entered water for the fear of it, or if you are an Olympic swimmer. Most people are fair swimmers. More important than skill at swimming, is a willingness to enter the dolphins’ home environment and trust that all is well. We will do all we can to keep you safe. At the same time, reasonable consideration needs to be made of the facts; we are land based mammals attempting to be marine mammals, so there is a certain liability inherent in this activity. Reservations are essential. I recommend booking before you come to Hawaii. A credit card # is necessary in order to secure reservation. This is 100% refundable for cancellations made 72 hours or more before the date of the trip during holiday seasons and spring break; and 48 hours at other times of the year. It is customary to tip the captain & crew if you are pleased with your experience and enjoy your day with us. Standard is 15-18%. YES!! We encourage children to come. 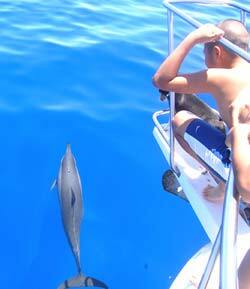 The dolphins adore them and it is a fabulous family adventure. Toddlers are not recommended because they can get restless on the boat, tend to like to climb and make everyone nervous, except the adventuring toddler. I have taken children from 3 months old to 90 years young. Capt. Nancy has a background in childcare and the teaching profession, so she particularly enjoys having the kids on the trip. The most important thing of all is to have fun. Dolphin Journeys provides the boat, snorkel gear, swim support, floatation devices, drinks and lunch. The dolphins are in their natural environment and join us at their free will. We attract them with our love and a demeanor of gratefulness. Most important is an open heart. Also bring a towel, sunscreen, and your own snorkel equipment if you own it and prefer to use it. Wear your bathing suit and a cover-up to protect yourself from the sun. It is provided on your Dolphin Journey and Sunset Manta Ray trip. If you own your own, you are welcome to bring it. We provide quality gear in a variety of brands to assure a comfortable fit. We use several boats of different size, depending on the number of guests on each trip. These boats are designed for SCUBA and snorkeling activities so they are easy to get into the water and back on the boat. For our smaller groups of up to six guests we use a 26 foot Skip Jack, Dolphin TLC with a warm water shower on the deck, small cabin, an onboard head and easy in and out of the water with a swim step and ladder. Yes. The bow of the boat that has no awning, so adequate sun protection is recommended. If you’re sun-sensitive, we’ll do our best to keep you as sun protected as possible. Usually everyone cooperates to keep you in the shade. We go north or south, along the Kona Coast. The Hawaiian Spinner dolphins spend the day playing and frolicking about 1/4 mile to 1 mile from shore. They love the clear blue water and sandy bottoms that are found here on the Kona Coast. No. We will be snorkeling, not diving. Yes! In fact we recommend it. Women who swim with dolphins while they have a child in the womb have many stories about the birthing experience being different from that of their other children and the babies born seem calmer and have a brightness about them that feels precious. Yes!!!! The dolphins are very loving beings and innocent to any need for aggression. They are wild and free, so if something upsets them or they do not want to be with us, they have the whole Pacific Ocean to be in. At every moment the dolphin is free and has space to move at free will. Like all animals, they will not be aggressive unless there is due cause. There is nothing we would do to create such a cause. The Spinner dolphins along the Kona Coast have joyfully been interacting with humans for many years and there is a great deal of mutual respect and love.